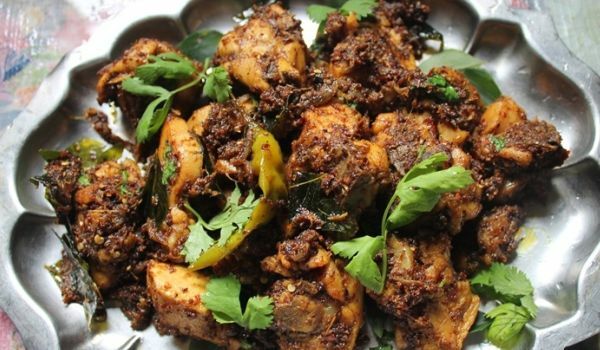 Chettinad Chicken Fry is a very popular recipe from the Chettinad cuisine. Learn how to make/prepare Chettinad Chicken Fry by following this easy recipe. Clean the chicken to ward off unwanted material from it and then cut it into pieces. Now, rub the chicken with a paste of salt and turmeric and keep it aside. Heat oil in a pan and put fennel seeds in it. When the seeds start to crackle, put red chilies and onion in it and fry well. When the onion turns brown, put chopped tomatoes and chicken in it and fry well again. Sprinkle hot water on it as required in small amounts so that the chicken does not stick to the pan. Remove from the fire when the chicken is cooked and serve hot.